Civic recognition will honour all the work done in the town by the Augustinian priest. Radical Augustinian priest Fr Iggy O’Donovan is to be awarded the Freedom of Drogheda later this month following a unanimous vote by members of the town council. The Mayor of Drogheda, Cllr Richie Culhane, confirmed to CatholicIreland.net that the decision was made on Monday evening by the Drogheda Borough Council. He said the civic recognition honours all the work done by the priest with volunteer bodies and the community while based in the town. Fr O’Donovan celebrated his last Mass as prior of the Augustinian community in Drogheda on 15 September and as many as 1,500 people turned out to bid him farewell. He has now moved to Limerick and is taking a sabbatical following representations by the Vatican’s watchdog, the Congregation for the Doctrine of the Faith, to his superiors in the Augustinians over his controversial views and an irregularity in a baptism ceremony which was reported to Rome. Fr Iggy is due to return to Drogheda on 24 October to accept the Freedom of Drogheda. He will become the last person to receive the prestigious honour before the conferring body is dissolved next year. Under the Local Government Act, the Drogheda Borough Council will be replaced by a municipal authority which will be headed by a chairperson. “As the 414th Mayor of Drogheda it was within my gift to nominate Fr Iggy for the highest award the town can bestow on its citizens,” Cllr Culhane said. He himself will be the town’s last Mayor. Other recipients of the award include Pope John Paul II, Charles Stewart Parnell and Eamon De Valera. The Mayor said the decision to award Fr Iggy with the Freedom was made in response to a stream of requests from citizens of Drogheda asking the Mayor and the Council to recognise him. He denied that it had anything to do with the recent controversy over the baptism. 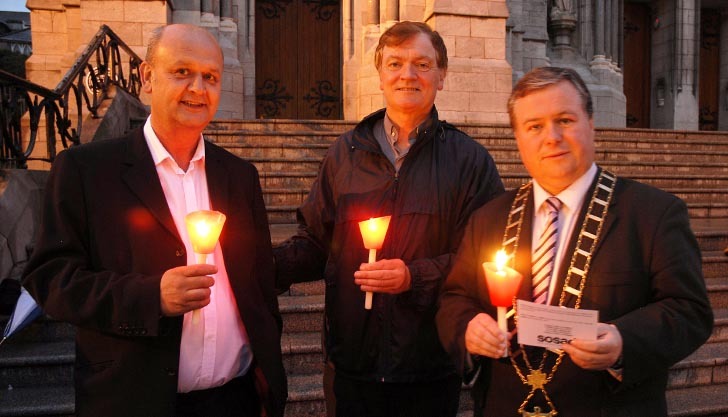 Prior to his departure from Drogheda, after serving two terms as prior of the Augustinian community, Fr Iggy had been involved with groups such as the Gary Kelly Centre which works with cancer sufferers, the SOSAD organisation which promotes suicide awareness as well as Action Against Addiction which recycles clothing as part of an employment scheme for recovering addicts. Other groups the radical priest has been involved with include the Old Drogheda Historical Society and Greenhills’ Girls Secondary School. “He was instrumental in setting up so many organisations – too many to recount,” Cllr Culhane said.